African-American History is on amazing, complex story of cowardice and courage, cruelty and generosity, hope, fear, and ignorance. Retaining the authority and chronological scope of the award-winning Encyclopedia of African-American Culture and History, Editor-in-Chief Jack Salzm... read full description below. African-American History is on amazing, complex story of cowardice and courage, cruelty and generosity, hope, fear, and ignorance. 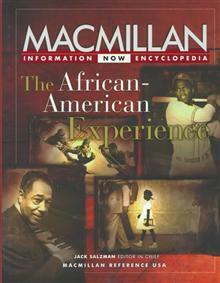 Retaining the authority and chronological scope of the award-winning Encyclopedia of African-American Culture and History, Editor-in-Chief Jack Salzman has chosen articles that present a sweeping overview of African-American history without sacrificing the fascinating details that helped create the fabric of our nation's history.